It’s open enrollment season, which means now is the time to renew or change your health coverage for 2018. Our certified agents are here to assist you in choosing an insurance plan that fits your needs. Call us today at (909) 392-5535. December 15, 2017: Last day to enroll in or change plans for 2018 coverage. After this date, you can enroll or change plans only if you qualify for a Special Enrollment Period. Health Insurance Open enrollment for Individuals and Families starts November 1, 2016 for 2017. Act NOW to sign up or change your plan. Call us now to see if you qualify for Subsidies to help pay the premiums. The time is here! If an application was submitted through Covered CA; starting October 12, 2015, individual and families can make changes or renew their current plan for 2016. If they do nothing by December 15, 2015, Covered California will automatically enroll members in their current or an equivalent plan for 2016. Important to mention, some insurance companies are changing their deductibles, benefits, co-payments and networks, so it will be important for all members to carefully review these changes before selecting a plan. Some plans will no longer be offered for 2016 and will be automatically moved onto a similar plan. For those that did not enroll for 2015 and would like to for 2016; starting November 1, 2015, they will be able to submit an application for 2016. 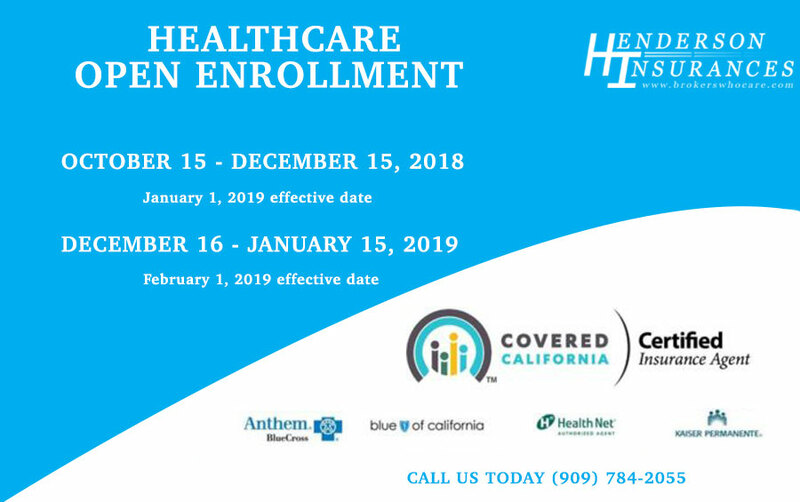 For those that did not enroll into Covered CA or want to make a change to their health insurance; starting November 1, 2015 you can make changes for 2016. After individuals and families rushed to meet the deadline date to enroll onto a health insurance plan, the government decides it is again going to extend the deadline date to February 22, 2015. Now this is after agents have been telling perspective clients they could not enroll after February 15, 2015. This brands agents as incompetent and ill-informed. It was not until mid-afternoon on Wednesday, February 18th that Covered California send out the notice to agents. So this is our way of apologizing to those individuals who called our office asking to apply for health insurance after February 15th. Now with the new deadline, from what we have been told, it does not apply to the insurance companies only if an application is submitted through Covered California. You are not permitted to make a plan change. This extension is only for those who did not apply prior to the February 15, 2015. Truly, we do not understand the mindset of those making these decisions. After all, a deadline date should be a deadline date and not an anticipated extension date. 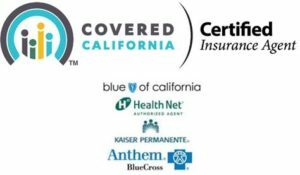 Why Use a Licensed Agent for Covered California Health Insurance? Why not call Covered California or even consider using an unlicensed person to sell you health insurance? If I did not know better and listened to what the media puts out along with the marketing Covered California has done over the past year and half, I would have probably called Covered California and submitted my application through them. After all, they know what they are doing, right? Answer to that question is, NO, they have no idea how to “sell” health insurance to people. Covered California is simply an exchange to get the government subsidy. Most of them are not Licensed Insurance Agents and certainly do not have the interest of the client in mind. So why would anyone trust their health insurance with someone who does not have a license to sell health insurance? Not to mention the years of experience in the health insurance industry. We have had clients call Covered California where the representatives will take the liberty to start a new application for one of our clients without telling them they will no longer have their agent on the new policy once the application has been submitted. This leaves the client without an agent and therefore must deal with the insurance companies on their own. Having 2 applications in Covered California will create so many complications with the insurance companies not to mention how it will affect the client. Like I said, they do not have the client’s interest in mind. Having an agent or broker, at least one from our office, does not cost the client additional money. The premiums are the same with or without an agent/broker. We do all the follow-up with the insurance company, handle billing problems, and assist with finding a doctor and more. What we recommend; do not contact Covered California or submit your application on your own without first speaking with a licensed insurance professional. We have our clients best interest in mind and not our bottom line. Change is nothing new for Insurance Brokers. Everyone is or should be familiar to changes in life; some are positive changes and others not so positive. However, change is a fact of life and how we deal with those un-welcomed changes is what’s separates the average broker from the exceptional broker. In the insurance industry, change is way of life for brokers. Changes occur in every aspect of our business, from the way a premium payment is handled to the underwriting of policies and etc. There are so many changes going on it makes your head spin. So, when health insurance brokers were faced with the changes implemented by the Affordable Care Act, we met this change head-on. Brokers attended seminars and read article after article with the latest information on the changes that were to occur. In the fall of 2013, brokers were required to attend an 8 hour face to face training and then take tests to become certified in order to sell through Covered California. By October 2013, brokers were prepared to start working with Covered California. When the time came to start submitting applications to Covered California, brokers were faced with the inconceivable…website crashed! There was no way to submit the application electronically. Then we were instructed to fax them, we did and guess what? We were told there was no way for Covered CA to process all of the paper applications. I could go on and on but I think you get the point. It was a mess to say the least and took months to get our clients enrolled. Then, we had to deal with the Insurance Companies, and to our surprise, the communication between Covered California and the Insurance Companies was nothing short of incompetent. So here we are in September 2014, and the communication between Covered California and the Insurance Companies has not improved much. Open enrollment is just 2 months away and the uncertainty Brokers have in dealing with Covered California still lingers. You see, change is something exceptional Brokers embrace and are not afraid of. We were all thrown into this mess, like it or not, and we will work hard to embrace the upcoming challenges. After all, this is what we do… assist our clients with their health insurance needs. Just a thought…things would have probably run much smoother if Covered California had solicited the help from Brokers in the design and implementation of the application process and their website. Changes made to just a mailing address and not the home address results in the entire family being placed into Medi-Cal and removed from their current insurance plan. Changes completed with Covered California are not reaching the individual insurance companies. Covered California is pointing the finger at the individual insurance company’s and they (the insurance company) are pointing the finger back at Covered California for not submitting changes. Agents were promised a “fee’ or a one time “commission” for applications submitted through Covered California for Medi-Cal recipients. As of today, May 21, 2014, Agents have been working for “free” because no money has been distributed to Agents. Insurance Companies are not permitted to make any changes other than billing. All changes must go through Covered California. As stated above those changes are not going to the insurance company. So we (Agents) continue to call until someone does their job. And, who said this would not been fun! Working with any state entity is frustrating, because most people working for these entities do not seem to care about the individual person. It is sad to see our industry being transformed this way. These are just our personal opinions and experiences. Are Insurance Agencies Optimistic About Healthcare Reform? Agents have proved to be the largest source of applications and enrollments in Covered California, outside of the self-enrollments. Agents have incurred considerable costs with no assistance from the federal or state government. Agents can attest to the technical problems not just with the Covered California website but with the Insurance Company websites as well. Not to mention the long hold times on the phone or not being able to contact the insurance company or Covered California at all. This by far has brought challenges to the independent agent. I wonder just how many people really know what they purchased if they did not use an agent to help them enroll onto a plan. We all have heard about PPO’s and HMO’s now there is another, “EPO’s”. Be careful of this type of plan, it acts much like an HMO. Let’s not forget the clients we serve…almost everyone who had an Individual or Family Health plan prior to 2014 lost their plan and most were not able to keep their doctors. Communication between Covered California as well as the individual Health Insurance Companies has been inadequate. In the years I have been working in this business I have not seen anything like this. Over the past month and ½ it has improved somewhat however, there is still the task of making sure Agents receive their commission from the insurance companies. This most certainly will take several man hours to accomplish due to the inefficiencies we have seen with the insurance companies and Covered California. As the account manager for Individual and Family health insurance for our agency this has by far been the most challenging “change” to occur in the health insurance industry. My personal opinion, it is a poor “fix” to the Health Insurance issues facing Americans. Now let us not forget the insurance premiums; for three quarters of our client base, premiums doubled and in some cases tripled. Please explain to us how this is “Affordable HealthCare”? The only positive, if you can say this as a positive, from my perspective is the fact that thousands of individuals and families have now been placed into the Medi-Cal system. This has created large backlogs with many still waiting to receive an ID card. Optimism is something I wish I could say I have when it comes to Healthcare Reform but I do not. With the employer mandate still yet to be implemented we will look forward to more of the same I am afraid.